Poor Euler Piruleta... he has forgotten how his own face looks like! Due to this problem he has started a never-ending quest to retrieve his face. Nevertheless, it seems that evil forces have spelled a cast on him and he has been trapped in what looks like an endless quest... Oh no! He is cast away in a Möbius Strip! 1) The Möbius Strip is a peculiar surface with intriguing characteristics. 2) Every surface that you know has two faces (a sheet, a coin, the floor...) but the Möbius Strip has just one face... an endless face! 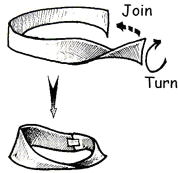 1) Build your own Möbius Strip. You just need a long (and at least 4cm-width) paper strip. Is it possible to paint the inside and outside of the Möbius Strip using different colors? Why? Once you are done… what do you get? How many “turns” does the object you have created have? 3) Repeat the procedure you have done in the previous step and describe what you get. Only if you fully understand the complexity of the Möbius Strip will Euler Piruleta be released from his infinity prison. Watch it: your solution must include pictures of the outcomes of every part: your original Möbius Strip, the one you get after the first cut and what you get after the second cut. Deadline: December the 3rd. Downlaod link. For amusement only: this was another endless quest that become quiet famous when I was in school! You say "Every surface you know has two faces (a sheet, a coin, the floor...)" but it's not clear from your examples, at least not clear to me, what you mean by either surface or face. If we look at the surface of a sphere and assume it has 2 faces then one would be inside and one outside. If we look at a cube we have an option. It could be viewed as having a single surface with two faces (1 outside & 1 inside). Or it could be viewed as having 6 surfaces with 12 faces (6 outside and 6 inside). What is true of a cube in this case is also true of any rectangular cuboid, even a very flattened one like a piece of paper. (It's important to remember that paper has 3 dimensions - length width and depth) This being the case an ordinary paper ring has either 2 faces or 8 depending on your point of view. And a paper Mobius strip has either 2 faces or 4. 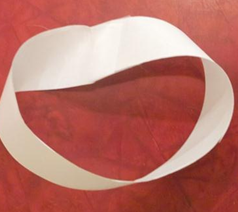 For a Mobius strip to have only one face it cannot be made out of a 3 dimensional material such as paper. A Mobius strip is 2 dimensional and there is no such thing as a 2 dimensional material. However, there is a way to make a 2 dimensional Mobius strip. 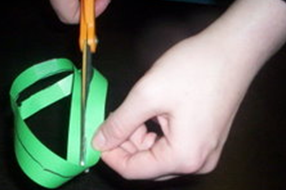 Make a Mobius strip using a strip of paper in the usual way. Slide a second piece of paper that is twice as long as the first over the the large surface of the Mobius strip. It will wrap around it and cover it completely. Join the ends of the second piece of paper to form what we can call a wrap strip. Remove the Mobius strip from between the inner surface of the wrap strip (you'll have to cut it out) without disturbing the wrap strip. The inner surface is now in contact with itself and contains a 2 dimensional space the same shape as the Mobius strip that was removed. This 2 dimensional Mobius space is interesting because it has only one adjacent area. That adjacent area is occupied by a single object- the wrap strip.